With my previous post I started to write a serious of blogs with the heading “My journey with Institut Technik & Bildung (ITB)”. These blogs are intended to support the work (or follow-up) of the ITB “Klausurtagung” that will take place on Friday 9. December 2016. The inspiration to write personal blogs that deal with the history of ITB comes from the Klausurtagung 2015, when we had a presentation by Klaus Ruth on some highlights of the history of ITB. With this series I try to compensate my absence due to health issues and to pass a message, wah has happened at different times and with different themes. 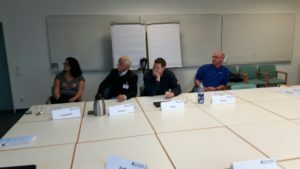 In the first post I tried to cover my first encounters – my study visit in 1989 and participation in the Hochschultage Berufliche Bildung 1990 conference. In this second post I will give insights into the Modellversuch Schwarze Pumpe – the pilot project with which ITB worked in European cooperation projects 1995 – 1999. As I indicated already in my previous post, at the end of 1980s and in the beginning of 1990s Finland was preparing structural reforms in the educational system. 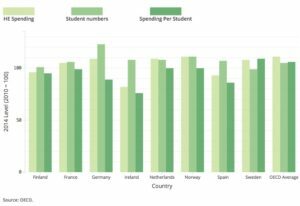 The mergers and upgradings in higher vocational education – the creation of the Finnish Fachhochschulen was less controversial and was implemented quickly. However, the corollary issue – how to keep a balance between ‘academic’ and ‘vocational’ learning pathways in the upper secondary eduvcation, was more problematic. Traditionally Finland had followed in its educational policies the Swedish reforms that emphasised comprehensivisation and unification of educational institutions and getting rid of separate ‘academic’ and ‘vocational’ tracks. However, in the above mentioned debates the Finns were distancing themselves from what they felt ‘academisation’ of vocational learning and were looking for alternative models. From this perspective, alternative models of curricular cooperation between ‘academic’ and ‘vocational’ learning were explores – as means to improve the attractiveness of vocational education- were discussed. And during these debated Gerald Heidegger from ITB was invited as visiting expert to contribute to such debates. Later on, when the Finnish upper secondary experiments (with curricular cooperation between Gymnasium and Vocational schools) was launched, Günter Kutscha from the University of Duisburg was invited to the international evaluation team (with his expertise on the Kollegschule implementation). In the light of the above it is worthwhile to note that the German educational policies in the 1990s were looking for new ways to enhance vocational learning and vocational progression routes. To a major extent this was motivated by efforts to re-integrate some of the educational models of DDR into the sytemic frameworks of BRD. From this perspective the ‘new’ Federal states launched several pilot projects (Modellversuche) to incorporate curricula with dually valid qualifications (Doppelqualifikationen). Whilst these ‘pilots’ were mainly based on existing established (and mostly successful) practice of the late DDR, there was a need to accommodate such programs under the dual system of vocational education and training (VET) and to clarify the progression models. In this context the pilots were setting new accents. In this context the ‘Modellversuch Schwarze Pumpe’ played a special role. Firstly, this was due to the industrial partner and the technologies involved- the energy plant LauBAG was relying on the regional brown coal resources. and related energy production. From the ecological point of view this couldn’t be characterised as sustainable, neither was the company at that time profitable. However, it was the major energy provider for a wide region and a major employer in the regional labour market. Yet, in the light of the inevitable exit from brown coal, the company had to find a balance between measures to keep skilled workforce for current production and preparing them for alternative occupational prospects after the brown coal era. Secondly, the educational concept of the pilot project was to introduce vocational curricula that provided dually valid qualification (craftsman certicate and access to higher education – Berufsqualifikation mit Fachhochschulreife) in integrated learning arrangements. Thirdly, as a special accent of ITB (as responsible for accompanying research) and due to the aptitude of local teachers and trainers, there was a special possibilty to develop integrative working and learning arrangements in which social shaping and self-organised project work played a major role. (I personally could experience this last mentioned aspect in the conferences hosted by MV Schwarze Pumpe in 1995 and in 1997 8n which the apprentices (Azubis) demonstrated their projects). So, in 1994 the combined Modellversuch started with Gerald Heidegger in charge of the accompanying research team in which Rainer Bremer was responsible for accompanying the school pilot and Hans-Dieter Höpfner on the pilot in the in-company training. In the light of the above it is understandable that the ITB approach in emphasising the Gestaltung (social shaping) idea and enhancement of vocational learning attracted European attention – in particular, when the MV Schwarze Pumpe provided a pilot ground to be studied. This possibility was picked by the Finnish-led project initiative “Finding new Strategies for Post-16 Edutacation (Acronym: Post-16 strategies). This initiative was inspired by the Finnish upper secondary pilot and its international review and the preparation of the project supported by the Finnish educational authorities. The project was approved as one with the strongest resources in the Leonardo da Vinci programme, strand ‘surveys and analyses’. Vocational enhancement (Upgrading of vocational curricula via internal development and enrichment – in the project covered by Germany and Austria. German contribution was provided by ITB on the basis of MV Schwarze Pumpe.). Having identified these main types the project avoided the trap to enter a ‘system competition’ between them – to ‘mainstream the winner’. Instead the project worked in small groups to learn more of the boundary conditions, pattern variances and relative strenghts/weaknesses of the types. Furthermore, the project promoted dialogue between the groups in order to find points for learning from each other. Finally, the project organised short mutual study visits of practitioners between differently positioned countries. Altogether, the project created an interesting European group picture. Unfortunately the immediate follow-up project Spes-Net didn’t have similar resources to keep the initial partners involved when new partners were brought in to carry out similar analyses and to position themselves vis-à-vis the above mentioned strategy types. Nevertheless, some level of dialogue could be maintained and some movements in the strategies observed. 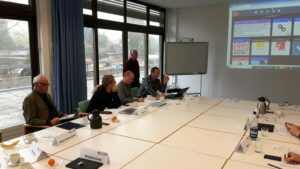 In addition to the above mentioned project Post-16 strategies, ITB and MV Schwarze Pumpe were involved also in another European project funded by the programme Leonardo da Vinci, surveys and analyses. The project ‘Integrated qualifications’ (Acronym: Intequal) was initiated by the German comparative VET researcher Sabine Manning (Research Forum WiFo). She had already in the early 1990s studied the newer German pilot projects on ‘Doppelqualifikation’ from the perspective of international comparisons. At the European level she had worked in a pioneering European project on ‘Modularisation’ in the field of VET. In this respect her project focused on the meso- and micro-systemic implementation of vocational curricula or schemes providing dually oriented qualifications. Austria – IBW and the WiFi Academies schemes in vocational adult education (supported by chambers of commerce). The Intequal project avoided debates at the systemic level and focused on the level of curriculum implementation, learning arrangements, assessment and learning careers. In this way the project gathered insights into the shaping of the curricula and on the feedback data that informed on the acceptance of the schemes. At the end of the initial project itsv work was continued by a multiplier-effect project ‘Duoqual’, but – in a similar way as with ‘Spes-Net’, the funding could only support the work of new partner countries but not effectively the dialogue with initial partners. Nevertheless, the mapping of curricula and schemes (promoting dually oriented qualifications) could be continued across Europe. I think this is enough of the MV Schwarze Pumpe and of the European projects in which it was involved as the German case. Here, it is worthwhile to mention that I was involved in these activities with a new role. From 1994 on I worked as a project manager at Cedefop (European Centre for Development of Vocational Training) and was accompanying European projects – and promoting cooperation, synergy and mutual exchanges across them. The two above mentioned projects developed most intensive cooperation and were strongly present in European events (e.g. ECER conferences and EU-presidency conferences of that time. Such networking and promotion of research cooperation was also practiced with other themes and projects. In my latest blog I started yet another series of posts on our contributions to the final deliverable of our EU-funded Learning Layers (LL) project. I might be repeating myself but it is worth reflecting, what kind of learning experience we have made with our partners in the Learning Layers Construction pilot. At the end of the journey we are able to highlight what all has contributed to the innovation processes we have been working with. In my previous post I discussed this with focus on the role of accompanying research in a process of multi-channeled research & development (R&D) dialogue. In this post I focus on the role of training interventions in our project experience. Can we claim that our training interventions have been based on a pre-designed ‘training method’ that guided the shared learning into good results? Can we present this ‘training method’ as the legacy of our project? Or – shall we interpret our training and learning experiences as a more complex process innovation in which we played a part – an active part, but yet only a part of the common story? Shall we present the training interventions as a thread in the story of the R&D dialogue – and as part of the same legacy? This time I present the answers that we can give by using extracts from our document “Training interventions as capacity-building for digital transformation – Construction pilot”. And here again, I hope that the extracts from the longer report text give a clear idea, what our answer is and why. The training interventions were introduced as a process innovation alongside and within the co-design (not as a finalised ‘method’ to be implemented). The early Multimedia training activities were introduced as a separate initiative, but gradually they became an important support for refocusing the co-design process. The Theme Room training campaign became a ‘whole organisation initiative’ and paved the way to use the Learning Toolbox (LTB) in the apprentice training projects of Bau-ABC in different trades. The Theme Room concept was proposed for a longer training campaign with more features. The documentation of the concept and use of materials (in Moodle) makes it possible to customise the approach (including the use of the LTB as a specific theme for training and tool for learning). Firstly, the Multimedia training activities were introduced as a separate initiative – rather loosely linked to the co-design process. Then, thanks to the learning progress of participants, the training results (the start of the blogs, the work with videos) became an important support for the refocused design work. With the Bau-ABC trainers’ own videos on opportunities and challenges for learning they could give impulses for the shaping of the Learning Toolbox. Secondly, after the early Multimedia training the Bau-ABC trainers wanted to introduce a lightweight follow-up activity with their weekly sessions for informal exchanges. However, they came to the conclusion that such activities do not support their learning sufficiently. Therefore, they proposed the Theme Room training concept and its implementation as a ‘whole organisation initiative’ in Bau-ABC. In this way the trainers’ informal learning was to be strengthened in collaboration with the research partners. This provided a new opportunity to bring the ongoing phase of design activities closer to the trainers’ learning processes. Thirdly, the Theme Room concept was proposed as flexible training model for open learning processes that were using given learning spaces (‘rooms’) for going through work-oriented learning processes that were shaped as themes. The pace was to be kept flexible and the ‘booking of rooms’ in force until the participants had completed their tasks. Then the rooms could be re-furnished. 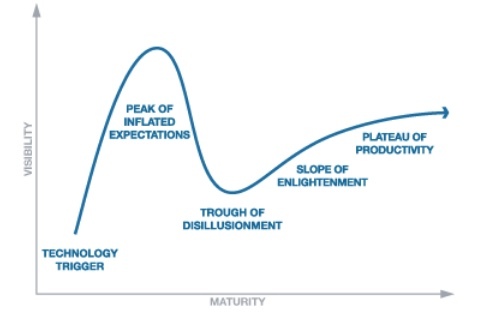 In this sense the model was designed for continuing and customised learning processes. In the first implementation it was neither possible to introduce the Learning Toolbox nor to make any use of it. 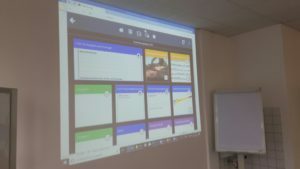 However, after the successful pilot testing in Bau-ABC it is possible to make the use of Learning Toolbox a central element of such training and to make using its functionality in a wide range of learning tasks. I think this is enough of the training interventions and their role in the whole process. We may not have drawn all the conclusions from this rich experience. And we may not have thought through, how to build upon this experience in the follow-up activities. However, we have made enough experiences to see, how the training interventions nurtured the co-design work and how the Theme Room concept can be enriched with the use of Learning Toolbox. This is clearly ‘social shaping’ (Gestaltung) in practice – both elements are co-shaping each other in a dynamic process. And we need to to take this experience further. 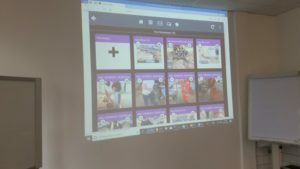 With my previous post I started a series of blog entries to catch up with the fieldwork of our ongoing EU-funded Learning Layers (LL) project. Because of my sick leave I felt the need to catch up with the recent fieldwork of the Construction pilot with the deployment of Learning Toolbox (LTB) – both in work-based learning and at construction sites. With my first post I summarised where we ended up with the introduction of the LTB in our field activities earlier this year. With this second post I provide insights into fresh feedback on the use of LTB by construction sector apprentices. 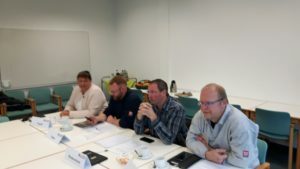 In the meantime our colleague Markus Manhart from the University of Innsbruck (UIBK) was on field visit at the construction sector training centre Bau-ABC in Rostrup to collect feedback on the use of LTB by apprentices and to interview their trainers. Markus has shared his results with us and I can only do justice to his good work by making his report available via this blog post. There is some evidence for a tool-supported change of the training patterns at Bau-ABC. In the past, apprentices and trainers had a rather hierarchical perception of training activities, characterised by limited autonomy for learners (= apprentices). Trainers told what to do and apprentices expected to get detailed instructions. Using LTB (and also AchSo) is partly contributing to a change towards more autonomous learning. The trainers tend to give apprentices more room of manoeuvre how to prepare and implement their projects. Instead of strictly instructing them, trainers tend to take the role of ‘guides’ for the apprentices. However, the increase of autonomy seems to be dependent on many factors: characteristics of learners, type of learning materials and achieved knowledge. Finally, the interpretation of the trainers on their own role will influence greatly, how such change can occur. In the past, learning material was provided in a one-way communication from trainers to apprentices. Thus, apprentices were more consumers of learning materials and recipients of trainers’ knowledge. Now, the new tools (provided by the LL project) support a transition towards a peer-to-peer mode of treating learning materials and knowledge resources. However, in this context it is important to note that the asymmetry cannot be completely abolished. From the perspective of trainers it is clear that some learning materials and knowledge elements cannot be freely produced or acquired by apprentices. Also, the apprentices are aware of their limits in this respect. What can be produced and shared in terms of peer-to-peer communication are problems with the apprentices’ projects or experiences with managing such projects (e.g. time management, planning work steps). What should not be produced and shared in such terms are instructions, how to perform project tasks (e.g. methods of how wooden beams should be prepared or constructed) and information on health and safety regulations (Arbeitssicherheit und Gesundheitsschutz). Interestingly enough, in the light of these examples digital transformation does not appear as a fundamental change of training and learning pushed by the tools. Instead, it is perceived rather as meaningful changes of specific practices. Regarding meaningfulness the apprentices gave the example on their obligation to document their daily project progress and achieved results. When working with paper- and pencil-based documentation the apprentices had several possibilities to cheat the trainers with their reports. In general, they could write down what the trainers would expect to get from them (even when this wouldn’t quite correspond with the reality). Thus, if a task has taken a whole day, they could report having completed it in three hours. Or they could omit mentioning problems they had encountered with project tasks in their reports. In practice their trainers would not always be in the position to monitor their work very thoroughly. In such cases, the marks given on their performance would not reflect the actual performance of the apprentices. This deficit in controlling would favour the ones inclined to cheat at the expense of the more honest apprentices. When documenting the work with project tasks with videos, the apprentices provide a true picture of situations, activities and results. This makes it possible for the trainers to assess, if the task was performed adequately. Thus, they are better informed on what grounds they can give the marks. In this way the changing pattern of reporting on apprentices’ projects serves as an example, how the use of digital tools in the interaction between trainers and learners enhances the apprentices’ commitment and motivation to appropriate task completion. I hope I have done justice to Markus’ text and conveyed the message he intended. To me his findings are important clues for our conceptual interpretation on digital transformation in workplace learning – as demonstrated in the context of the training centre Bau-ABC. In my next post I will discuss our recent efforts to promote the use of LTB in craft trade companies in the construction sector. In my five latest posts I have written a series of blogs on my journey with ECER conferences and the VETNET network. In these posts I have discussed the development of the network from its earliest origins in the beginning of 1990s up to present date. These blogs are my contribution to the European Conference on Educational Research (ECER) 2016 and to the celebration of the 20th anniversary of the founding of VETNET – the European Vocational Education and Training Research Network. Unfortunately I have to stay out of ECER because of health issues, but these posts may serve as building blocks for the collective memory. In this epilogue I shift the emphasis from the past to the preparation of the forthcoming conference with some final remarks. My first remark is related to the preparation of the VETNET Opening colloquium. Interestingly enough, the VETNET organisers have invited once again James Wickham as a keynote speaker (he had this ro le also in ECER 2005). To me this was a very good choice. In 2005 made interesting comparisons between ‘the European dream’ and ‘the American mirage’ as leading ideas for European training and labour market policies. Now he has chosen the heading “Always the first cut – vocational education and training in the Irish crisis”. It would be interesting to see, what kind of links he might make between his earlier analyses and those on the present crisis. My second remark is related to the way in which we discussed in ECER 2005 on the role of research communities (in regional initiatives) and on the support provided by social networking and web tools. At that time we were dependent on very early stage of web technologies and related possibilities for social networking. At that stage the interaction between researchers, tool developers and practitioners was far more complicated (and the chances for participative design were far more limited). Now, our experiences with the Learning Layers project (and with the online tools of the VETNET network and the IJRVET journal) open new horizons. Finally I would like to make a point on the visibility of VET research – both within the EERA community and at a more general level. In both respects the VETNET network was in 2005 still in the process of making its case. The subsequent years of stabilisation, consolidation and new initiatives have clearly given more visibility to VETNET and European VET research in the context of ECER and the EERA community. And in particular the launch of the journal IJRVET and its success have brought the public visibility of European and international VET research to a new level. I guess this is enough food for thought for those who are on the (rocky) road to ECER 2016 in Dublin. It is a pity that I cannot join them. But I will keep in touch and then catch up with the news. I am looking forward to that.